What’s new and exciting in your lives? Brief Synopsis: Simple facts about familiar bugs in a rhyme. Links To Resources: One back page of the book includes a display of actual-sized bugs so young readers can see how big they are in real life and how they compare with each other. Another back page compares facts about all the insects mentioned in the book: can it fly, where does it live, etc. Here are a few activities, and here are a bunch of coloring pages. Why I Like This Book: This book is delightfully simple. Easy enough for youngest readers to enjoy, but with enough information in the back to interest slightly older children. The pictures are bright, colorful, and engaging and do a great job of making bugs look friendly and non-threatening. I’m not really much of a bug person, but I find this book very appealing 🙂 This is also an interesting example for writers to study. The author gets across information in a fun way in only 76 words! On Monday, I will announce who won the October Pitch Pick, who won the giveaway of SARAH GIVES THANKS by Mike Allegra, and who won the giveaways from Faith The Heroic Pony’s special Would You Read It post on Wednesday. The wonderful and delightful Vivian Kirkfield has invited me to her blog where I will be a guest on her Will Write For Cookies series tomorrow (Saturday Nov. 16), so please go visit her! PPBF bloggers, please leave your post-specific links in the list below so we can all come visit you and see what terrific books you’ve chosen this week! I will have to study this one at 76 words. I'm in favor of taking the PPBF break for the whole time. I think I was tentative for a Would You Read it during the period (maybe Dec. 11). so let me know my new date. Going to put these dates on my calendar. I like it because it's just so simply done – short, sweet, to the point, and yet still interesting and fun. I have a lot to learn from Bob Barner's level of succinctness 🙂 I will email you about WYRI. You did well using your Succinctness Hat. I'm not the biggest fan of bugs (eek!) but it sounds like today's PPBF choice presents them in a fun way even I can enjoy. I also think you are quite right about making sure to enjoy that special family time. That is the kind of quality time well spent. Kids are so fascinated with bugs. This would be such a fun read for all ages. Really like your choice. The cover is engaging for kids. Such a nice choice for our list. As far as PPBF, you have to do what is best for you. You've been super busy. Many will want a break. With the holidays, it's a great time to share books for parents to purchase as gifts. So, I will publish a few reviews anyway, whether or not they make your list. Morning to you, Susanna. Lovely picture book and Oh my, only 76 words! Thanks for the posting of new dates. Will mark on calendar. You certainly need the break. Have a great weekend. See you over at Vivian's tomorrow ~ who wouldn't want to write for cookies? I love the sound of this book. My library has it and I just put it on hold. 🙂 Also, Little Red Writing just popped up as “Ready” on my hold list this morning!!! I will do whatever you need to do for the PPBF schedule. I have two Christmas books for review…yes…already chose them 🙂 I know you have to leave time for the contest, so don't overwhelm yourself. You need to enjoy the holidays! Gobble! Gobble! and Ho! Ho! Ho! I wholeheartedly endorse your plan to take some time off over the holidays (both holidays). If you decide to make the 20th a non-PPBF day as well (thinking of all there is to do in the lead-up to the holidays, plus all you will have done for the contest), that works for me. The book you've chosen today might even make a bug-shudderer like me enjoy bugs (at least those safely in illustrations on a page!). Cute book, Susanna! My Dad always thought that getting up close and personal with bugs relieved kids fear of them. Not to sure it worked with me! I love the idea of taking off as many days as possible around the holidays. That will relieve all of us, so we can spend time with the family (and maybe get a little extra writing in! Kudos for thinking of it, and being brave enough to mention it. Seriously…thank you again, Susanna, for all that you do for us…I'm so glad you will be taking a little time to enjoy your family. I know that you truly enjoy the blogging…and we are very appreciative of the contents, PPBF, writing prompts, WYRIW and everything else…but it does take a huge chunk of one's life. Ahh, the gift of time! Glad you like the bug book, Pat 🙂 And yes, I do know that it's a good time to post books for gifts, and also the only time where it feels appropriate to share out favorite holiday titles (even though of course technically we could do it in March or July :)), so I will see what the general consensus is. I can always put the list up for anyone who wants to use it, and it may just be a short list. It tends to be anyway during that time – usually only 9 or 10 people participate in those busy holiday weeks. “…not really much of a bug person…” is the understatement of the century for me. *shiver* One of my friends blogged about jumping in a pile of leaves, yesterday. My first thought was – There could be spiders in there! I missed both mornings, Julie… too busy!… but I'm looking forward to watching the recordings. What I saw was interesting and informative. I would have liked to see a little more relevance to picture books writers, but as I said, I missed a lot so maybe it's in there. You should take some time off! I love the idea of unplugging for the holidays, Susanna. Thank you! And I love the idea of writing for cookies. Your holiday schedule sounds perfect! I hope you'll get in good family time and still maintain your professional life to your satisfaction. 🙂 My family always tells me I spend too much time online. I have this book in my classroom! Trying to catch up on all my blog-reading. 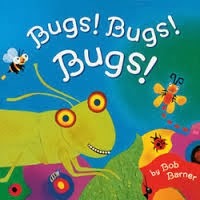 . . what is it about rhyme that makes bugs so much more appealing?! 'Gotta check this out. Thanks. I'd like to hear about Get Read conference. Maybe a post on MPBM?